“Inspiration” for me has come from some weird and wonderful places over the years. My athletes are without question one of my biggest sources of inspiration alongside my family. Inspiration is the fuel that fires my motivation as a coach and im lucky enough to surrounded by a super bunch of athletes that help flame this fire on a daily basis. Inspiration can be found in many different places and on many different levels. On a daily basis its the way my athletes go about their business but on a much larger scale that inspiration can come from events such as they amazing Olympic games we’ve just experienced. Sources of inspiration surround us on a daily basis and its important to realize what these sources are and how you can use them to drive you forwards in 2013. Usually when I write something like this its because I’ve just experienced some source of inspiration that makes me want to get tapping away immediately. This inspiration comes from an unusual place this time, my usual sources are people, books, films etc. Never did I think I could be so inspired by a race organizer! Actually this is doing him and many other people like him a huge disservice because I think all race organizers and their helpers are amazing people that give up so much of their time for other people’s enjoyment. Quite frankly if these individuals weren’t out there, there wouldn’t be any races at all. This is no ordinary race organizer though and definitely no ordinary man. The race in question is the New York City Marathon; the race organizers name is Frank Lebow. Some of you might have been lucky enough to have run this extraordinary race, I was one of these people back in 2007. It can definitely be listed of one of my favorite races of all time, there’s something very special and magical about the race that has grown to be one of the most popular races in the world. I had heard his name before but was slightly unsure of where it had come from, I knew he had something to do with running. Then I stumbled on a brilliant docu-film last week called ” Run For Your Life” and was amazed to discover the film was about Frank, his life and the New York City marathon. So where did it start, it all started with Frank of course. It all started with a man with great passion for something he loved doing – running. He wasn’t the most naturally gifted runner in the world but who cares when you derive so much enjoyment from what you do. Most importantly he loved to see other people derive so much pleasure from running as well. You have to remember that the early 70’s were a very difficult time for running, most people were considered to be a bit weird or crazy if they liked to run. People just didn’t understand the need to exercise like we do today so you were definitely thought of as being a bit odd if you were seen out pounding the streets! But Frank was a man with a passion and like all people with this level of passion he wanted others to experience it the enjoyment and reward he experienced through running, so he started organizing very small races which eventually lead onto him starting the New York Road Runners Club which he presided over for 20 years. This ultimately led to him being the man that created the New York City marathon as you see it today. For something to grow it takes a person with vision and passion, it also takes and extraordinary amount of belief in what you are trying to create. 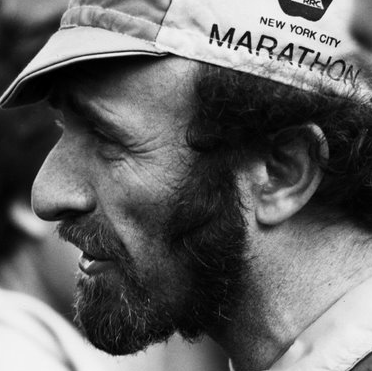 Frank had all this in abundance and he used his considerable charm and wit to change people views on running, most importantly it was this passion that was able to influence the powers that be to allow him to start the New York City marathon. The first New York City Marathon was held in 1970, with 127 competitors running several loops around the Park Drive of Central Park. Only about one hundred spectators watched Gary Muhrcke win the race in 2:31:38. In fact, a total of only 55 runners crossed the finish line. Over the years, the marathon grew larger and larger. In order to accommodate the growing number of participants, Frank redrew the course in 1976 to incorporate all five boroughs of New York City. This was a massive undertaking to combine all these 5 boroughs into one race but Frank was able to assert his passion and belief that one day this could become one of the biggest races in the world, eventually New York backed him and the rest is history. Today nearly 50,000 athletes every year experience the personal reward of training, competing, and raising funds for essential research that has changed and saved lives. Probably one of the most emotional scenes in the film is when Frank was finally able to complete the race for the second time (he ran it the first year in 1970) then again on his 60th birthday. At this point Frank had brain cancer, this didn’t stop him because with all his true grit and determination he was able to run it with his dear friend, 9-time NYC Marathon women’s winner Grete Waitz with a time of 5:32:35. Frank died in 1994, his memorial service at the finish line of the New York City Marathon, attracted a crowd of 3,000 mourners, which was, at that time, the largest memorial gathering in Central Park since the death of John Lennon. What I loved about the story was that this is was definitely a life to be celebrated, Frank’s memory will always live on in that race and will never be forgotten. He certainly inspired me to want to be a better coach and to use my skills to help other people experience what I experienced as a triathlete/swimmer. Most importantly I think Frank possessed a lot of the great qualities I see in athletes who achieve their dreams and goals in sport. These are great passion, enthusiasm, stubbornness, positivity and a willingness to go that extra yard. These are the people that will never ever give up even in the face of insurmountable odds. For every athlete that has gotten to the top always remember there’s also a long story of incredible disappointment and many failures behind it that lead to that point. Success doesn’t come easily and you have to persist and be incredibly stubborn to achieve your goals. So as we move into a new year, try to take a moment to think of who or what will inspire you to dig that little bit deeper in 2013. Then put it away in a little box and only use it when the going gets tough. This could be when racing or if you get ill or injured, its these sources of inspiration that will help you battle on through. Usually inspiration comes people you know or have read about, when you tap into them they can bring sunshine into the darkest of places. I will leave you with my favorite quote from last year, this comes from former Ironman pro Jasper Blake. It inspired me hugely, hope it will do the same for you. No matter how good you get or how good you think you are, remember that you are never entitled to anything and the sport owes you nothing. You need to approach it as if you owe the sport everything. Never underestimate how much work you will do and how much you will have to give of yourself to get good. If you want to win you have to earn that rite every single year, every single month, every single week, every single day, every single workout. But don’t look at it as a sacrifice; consider it a gift that you have the opportunity to go down that road. Hope you all have an amazing 2013!